This tutorial shows you how to enable Wi-Fi on an Arduino MKR1000 board and connect to a Wi-Fi network. Have an Arduino MKR1000 board. Have Internet connectivity to fetch remote Mynewt components. Have a computer to build a Mynewt application and connect to the board over USB. Have a Micro-USB cable to connect the board and the computer. Have local Wi-Fi network that the computer is connected to and that the MKR1000 board can join. Have a Serial Port Setup. Have a Segger J-Link Debug Probe. Install the Segger JLINK Software and documentation pack. Create a project space (directory structure) and populated it with the core code repository (apache-mynewt-core) or know how to as explained in Creating Your First Project. Read the Mynewt OS Concepts section. Create a new project if you do not have an existing one. You can skip this step and proceed to fetch external packages if you already created a project. Mynewt uses source code provided directly from the chip manufacturer for low level operations. Sometimes this code is licensed only for the specific manufacturer of the chipset and cannot live in the Apache Mynewt repository. That happens to be the case for the Arduino Zero board which uses Atmel SAMD21. Runtime’s git hub repository hosts such external third-party packages and the Newt tool can fetch them. To fetch the package with MCU support for Atmel SAMD21 for Arduino Zero from the Runtime git repository, you need to add the repository to the project.yml file in your base project directory. Mynewt uses source code provided directly from the chip manufacturer for low level operations. Sometimes this code is licensed only for the specific manufacturer of the chipset and cannot live in the Apache Mynewt repository. That happens to be the case for the Arduino Zero board which uses Atmel SAMD21. Runtime’s github repository hosts such external third-party packages and the Newt tool can fetch them. To fetch the package with MCU support for Atmel SAMD21 for Arduino Zero from the Runtime git repository, you need to add the repository to the project.yml file in your base project directory (arduinowifi). 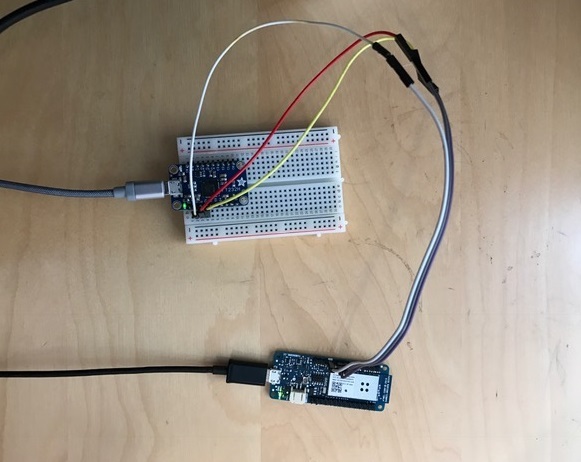 Here is an example project.yml file with the Arduino Zero repository added. The sections with mynewt_arduino_zero that need to be added to your project file are highlighted. Note: On Windows platforms: You need to set vers to 0-dev and use the latest master branch for both repositories. NOTE: If there has been a new release of a repo used in your project since you last installed it, the 1-latest version for the repo in the project.yml file will refer to the new release and will not match the installed files. In that case you will get an error message saying so and you will need to run newt upgrade to overwrite the existing files with the latest codebase. You need to create two targets for the MKR1000 board, one for the bootloader and one for the winc1500_wifi application. Run the following newt target commands, from your project directory, to create a bootloader target. We name the target mkr1000_boot. Run the following newt target commands to create a target for the winc1500_wifi application in the arduino repository. We name the application target mkr1000_wifi. Run the newt create-image mkr1000_wifi 1.0.0 command to sign and create an image file for the Wi-Fi application. You may assign an arbitrary version (e.g. 1.0.0) number. Connect your computer to the MKR1000 board with the Micro-USB cable. 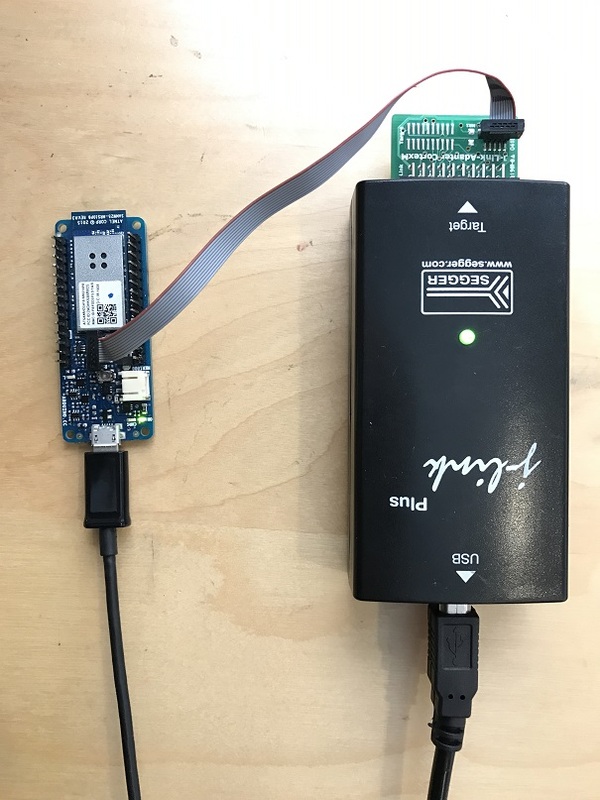 Connect the debug probe to the JTAG port on the board using the Jlink 9-pin adapter and cable. Mynewt will download and debug the target through this port. You should see a green LED come on and indicates the board has power. Set up a serial connection from your computer to the MKR1000 board (See Serial Port Setup). On the MKR1000 board, the TX pin is PIN 14 and the RX pin in PIN 13. Mac OS uses the format tty.usbserial-<some identifier>. Linux uses the format TTYUSB<N>, where N is a number. For example, TTYUSB2. MinGW on Windows uses the format ttyS<N>, where N is a number. You must map the port name to a Windows COM port: /dev/ttyS<N> maps to COM<N+1>. For example, /dev/ttyS2 maps to COM3. You can also use the Windows Device Manager to find the COM port number. Note: On Windows, you can use the PuTTY application. Type wifi start to start Wi-Fi. Compiled on May 17 2017, 15:29:14. Connect to the local Wi-Fi network. Note that the MKR1000 board only supports 2.4 GHz Wi-Fi networks. Run the wifi connect command and specify your network and . After you are connected to your wi-fi network, run the net service command to start network services. From a terminal on your computer, telnet to ports 7, 9, or 19 using the IP address your board has been assigned. Type something on this terminal and see the console output (on minicom). Can you see the difference in the behaviors? One port echoes whatever is typed, one discards everything it gets, and the third spews out bits constantly. Type wifi stop to disable WiFi on the Arduino board.